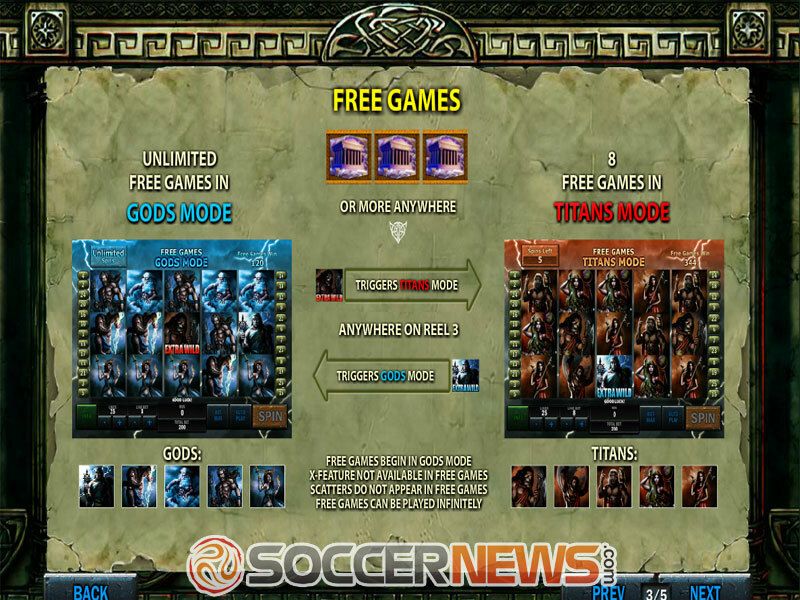 "Join the epic battle between Gods and Titans in this exciting Playtech title! No matter which side you choose, victory will be yours in the end!" One of the most epic events of Greek mythology was an inspiration for this 2013 Playtech release. Battle of the Gods was a ten-year-long series of battles fought between the Titans and the younger gods. This war decided which generation of gods will rule the universe and ended in victory for the younger ones, who would come to reign on Mount Olympus. Now, this fight of mythological proportions is coming straight to the reels in the 5-reel 3-row video slot with 25 adjustable paylines. 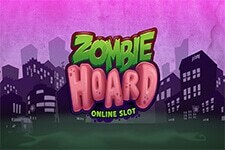 You’re in for a lot of Wilds, Scatters along with a Free Spins bonus game available in two different modes and multipliers. Wilds can be especially lucrative, while the X feature is also an interesting addition to the game’s offer. 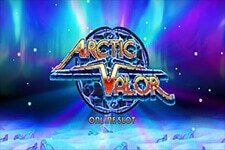 Prepare for a showdown of epic proportions and expect hefty wins during the Free Spins feature. The Coin denomination and the number of active paylines will determine your bet. The coin value ranges from $0.01 to $10 and depending on how many paylines you select, the wager can be anywhere between $0.01 and $250 per spin. 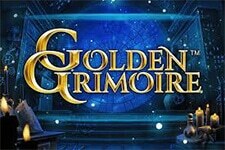 The atmosphere of the game is eerie, with both Gods and Titans populating the reels. The former have a blue background and the latter – a brown one. The Gods symbols include Poseidon, Hestia, Uranus and Chaos, fighting for the place on Mount Olympus. We were surprised to see there are no playing card symbols, but it’s not like you’re going to miss them. 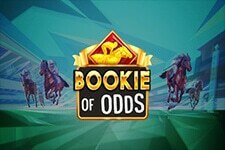 Players can benefit from the X feature, which is activated whenever Gods symbols on reels 2, 3 and 4 form an „X“ pattern, which will immediately pay a prize worth 5x the triggering bet. The multiplier will also apply in the Free Spins feature, which is triggered when three or more Scatter symbols land anywhere on the reels. First of all, all wins made during this feature will be doubled. 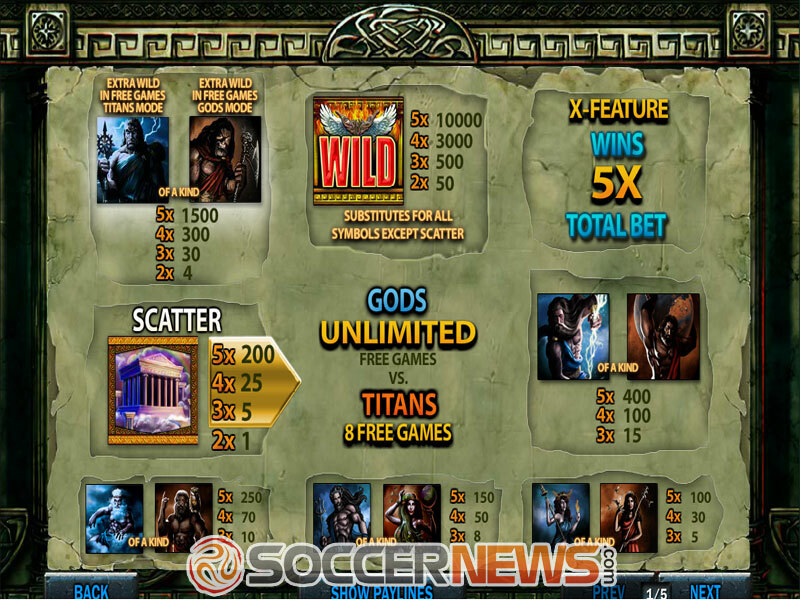 The round starts in the Gods Mode, where the number of spins is unlimited, and only Gods symbols, Wilds and Titan extra Wild will appear on the reels. 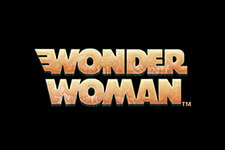 Once Titan extra Wild lands on the reel 3, you’ll switch to the Titans Mode, where only 8 free spins are available. In this mode, only Titan symbols, Wilds an God extra Wild symbols will appear on the reels. God extra Wild will take you back to the Gods Mode. 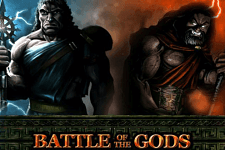 Battle of the Gods is a medium variance game with an expected RTP of 94.04% and the potential to give hefty wins in the Free Spins feature. 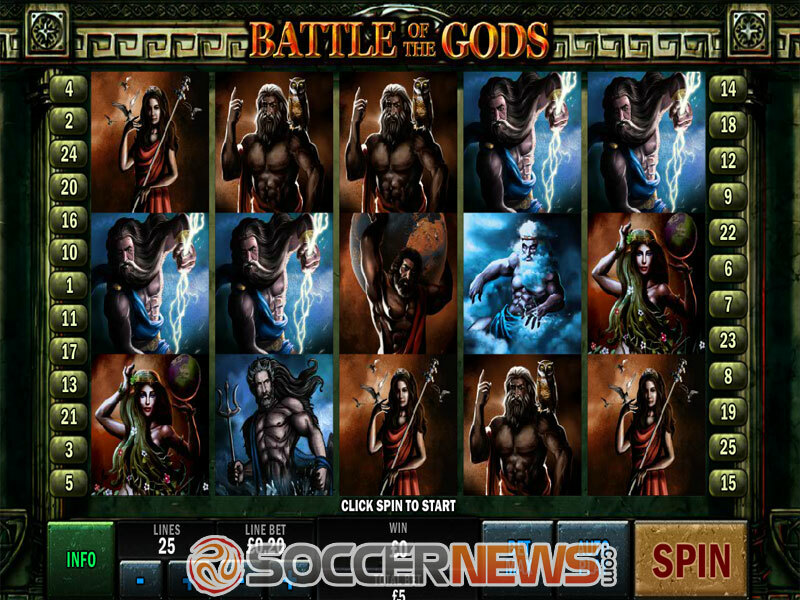 Find Battle of Gods at any online casino powered by Playtech. See who wins in this epic battle. "We can’t help the feeling Playtech could have done it much better with Battle of the Gods. 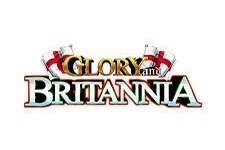 It’s not so bad and it offers a decent gaming experience, although it can become a bit boring after some time. The two modes are an interesting solution, kudos for that, but apart from the Free Spins feature, this game has little to offer."